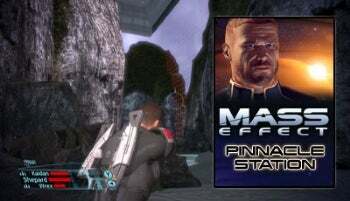 Did you hear there's a new Mass Effect downloadable expansion out for both Xbox 360 and Windows? It's called "Pinnacle Station," it just dropped today, and that's not all: They've released a patch for the Windows version too. I know! Didn't see either of those coming. I mean, they hinted at stuff to come after "Bring Down the Sky" (the last--and only--downloadable expansion to date) in the podcasts and interviews. But Mass Effect's three years old now. 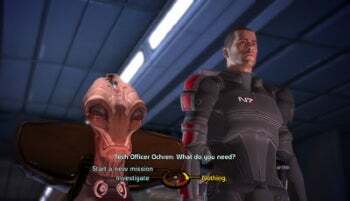 I figured they'd decided to let the series lie, full steam ahead to Mass Effect 2 (see my four-part interview with series lead producer Casey Hudson for the latest on the early 2010 sequel). On the other hand, the timing kind of makes sense. Mass Effect was just released as one of Microsoft's Games-on-Demand titles. Any Xbox 360 owner with a LIVE account can pull the full game down to the hard drive, no disc or retail transaction necessary. And you guys clearly dig Mass Effect. As of this post, 38,453 of you have voted it roughly 4.5 out of 5 stars via Microsoft's user-rating system. Test the limits of your combat prowess aboard a remote, top-secret Alliance space station. Do you have what it takes to hold the top spot amongst the best of the best? This module includes a new land-able space station, 13 exciting combat scenarios, and approximately 2-3 hours of game play. Required: you must achieve Spectre status before embarking on this mission. - Visit the military training center at Pinnacle Station and engage in a series of combat simulations. 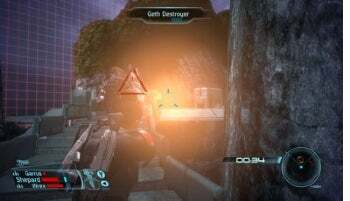 - Players of any level can hone their Mass Effect combat skills, shooting your way to the top in 12 unique combat scenarios. - Make a bet with the station Admiral in a final 13th mission. The stakes are high, Shepard risks his life and the life of his crew to prove that he is the best of the best. - Farm your main game achievements in an easy to access combat simulator. - Player can take their prizes and play with them in the main game. Making your next playthrough easier. - Combat is more dynamic and fast paced. - Combat simulator feels like a hollo-deck of sorts, environments and enemies look simulated. - Encounter Vadinos (Turian), and win his weapon. Download size? About 264MB. Available through the Xbox 360 dashboard, or for Windows gamers by clicking here, via the EA Store. The Windows patch, which fixes nearly two-dozen bugs and crash-related glitches, can be downloaded directly from Bioware by clicking here.